Its time to spoil Grandma and Grandpa with Gift Ideas for Grandparents Day. GiftsForYouNow.com has many Unique Gift Ideas to help you celebrate Grandparents Day in grand style. May we suggest a Personalized Picture Frame and include your favorite photo of the grandchildren or perhaps a Personalized Sweatshirt displaying all of Grandma's and Grandpa's grandchildren. Don't Forget - Grandparent's Day is September 9, 2018, be sure to get Grandma & Grandpa something nice today as a thoughtful way to say Thank You for everything they do day after day. Everything I expected. Great product for a great price. Her garden just got a whole light brighter when this Personalized Grandma's Garden Yard Flag is displayed. Featuring the names of her children/grandchildren, this pretty spring flag will become a permanent fixture in Grandma's or Mom's yard or garden bed. Personalize this garden flag with any title and up to 12 names to make a customized garden decoration she will love. Give all your hearts to the one you all love with this custom We Love You picture frame. This All Our Hearts personalized wood frame can be customized with any title up to 16 letters _�� including Nana, Mom, Gramps and more _�� and up to 12 names (up to 12 letters each) to make this an extra special keepsake for the one you hold dear. 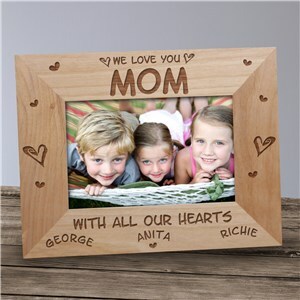 This engraved wood photo frame is great for birthdays and Mother's Day Personalized gifts! It comes in three great sizes and can be wall hung but also includes an easel back for tabletop display. Engraved & personalized gifts for Mom are all here at GiftsForYouNow! Ask any grandma what her favorite part about being a grandma is to her, and she will undoubtedly say: her grandchildren. Our personalized Grandma t-shirt mirrors that sentiment. This custom "how much love" shirt reads: I never knew how much love my heart could hold till someone called me Grandma, followed by up to 30 names. This is great for Mother's Day Gifts For Grandma and also could be a personalized Mom shirt, or Nana, or teacher ... this beauty is customizable with any title and up to 30 names! Shop for a Personalized Grandma Shirts today! 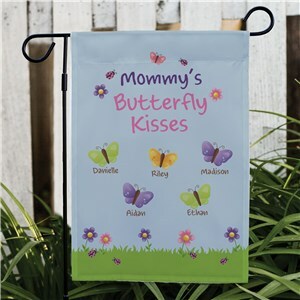 Butterfly kisses will fill your home when this colorful garden flag is displayed in your yard or flower bed. It is a wonderful way to welcome your children or grandchildren with open arms. Personalize this garden flag with any title and up to 20 names. Spring Decor is easy with GiftsForYouNow. 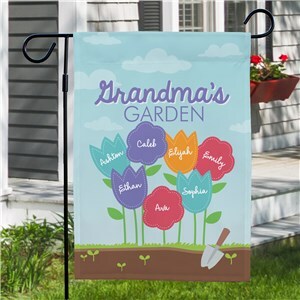 Welcome your grandchildren with open arms and love with our Personalized Grandparents Garden Flag. 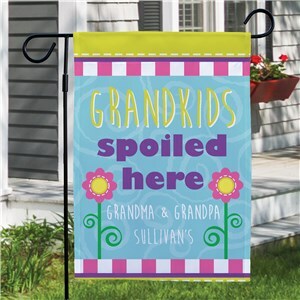 Perfect as Grandparents Gifts, this is a great outdoor decoration to express your joy happiness you feel every day your grandchildren are around. Free personalization is included. Personalize your Grandparents Flag with with any two custom lines. Give her a gift she will want in every color with our Personalized Grandkids Make Me Smile T-Shirt. We will create Personalized Gifts For Grandparents like this shirt with any title and up to 16 names to make it one of a kind. Makes a great gift for Christmas or as a birthday gift! Her garden just got a whole light brighter with this personalized garden flag displayed. 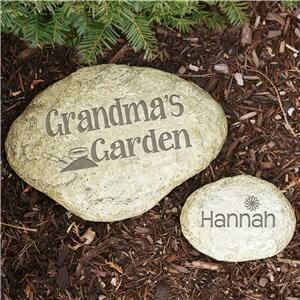 Featuring the names of her children/grandchildren, these personalized gifts for Grandma becomes a permanent fixture in her yard or garden bed. Personalize this garden flag with any title and up to 12 names. 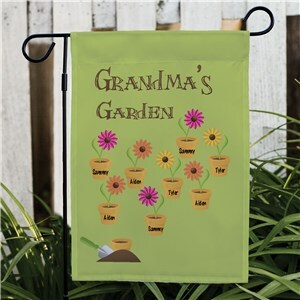 Our custom garden flags will also make for the perfect personalized gifts for Grandma! Grandmas love their grandchildren. 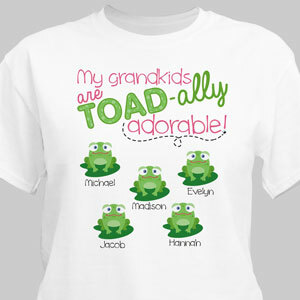 These "toad-ally" adorable Personalized Grandma Shirts with grandkid names will have your grandma wearing them all close to her heart. 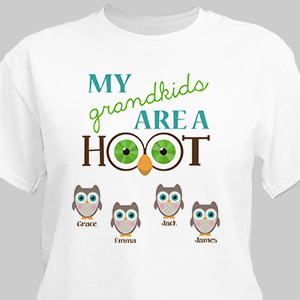 This custom grandkids shirt isn't just for grandma: It can be personalized with any title and up to 30 names! The guy who is serious about grilling will seriously appreciate this embroidered barbecue apron. It protects clothes and offers so much more. Great as a personalized Father's Day grilling gift, this two-tone blue and black easy-care apron includes an adjustable neck strap and back tie and features an oven mitt, a bottle opener, a bottle holder and a towel. 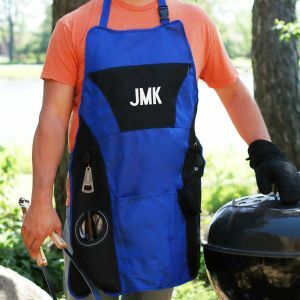 Spacious pockets are ideal for holding grill tools in this lightweight apron, which will be personalized with any initials or name (up to 12 letters) in your choice of thread colors. Makes unique groomsmen gifts are easy too! 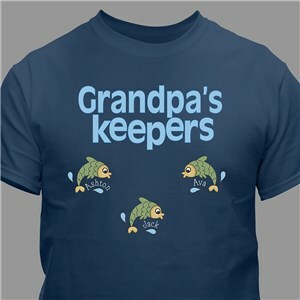 Celebrate grandpa's love for his grandchildren and fishing at the same time with this Personalized grandpa's keepers fish t-shirt! Great as Father's Day Presents For grandpa. Personalize your Grandpa shirt with any title and any names of your special "keepers" for an item any grandpa or special man in your life will love. Shop Father's Day gifts now. 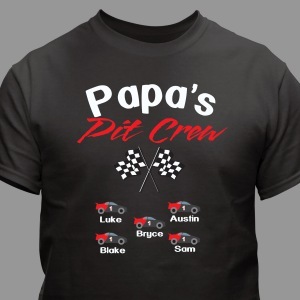 Get Grandpa ready for the big race with this cool Pit Crew Personalized T-Shirt. Perfect for any birthday, Christmas, or just because. They also make excellent personalized gifts for Grandparents. Free personalization of any title & up to 30 names are included. Titles on these Grandparents T-shirts can be anything you choose, whether it's Grandpa's, Grandma's, or any special person in your life. 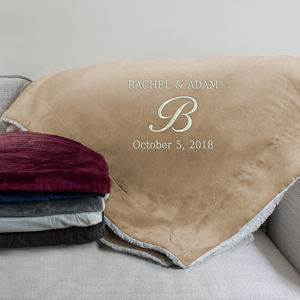 Anyone looking for special couple gifts will love this unique Embroidered Couples Initial Sherpa Blanket to snuggle under and remind them of their special day. This personalized throw blanket is embroidered with any custom message, any initial, and date in your choice of thread color. Our soft and cozy throw will make a practical keepsake for years to come. 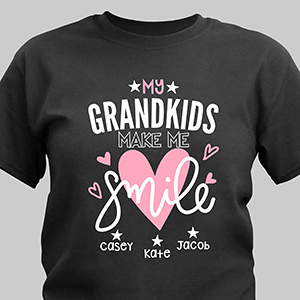 Fill your Grandma’s heart with the love of her grandchildren by displaying each one of their names on these wonderful Personalized Grandma TShirts. 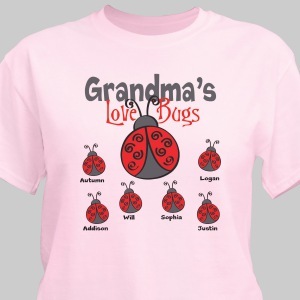 Grandma is sure to love this Love Bugs T-Shirt featuring each one of her precious little grandkids. 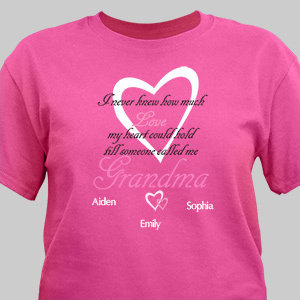 This Personalized T-Shirt for Grandma also makes an excellent gift for Mom’s & Aunts as well. Our Personalized T-shirt is available on our premium white, pink or ash gray 100% cotton t-shirt, machine washable in adult unisex sizes S-3XL. Includes FREE Personalization! Personalize your Love Bug T-shirt with any title and up to 30 names. Bring love to your garden with these personalized yard stones. Engrave any name or title on our large garden stone and any name on the small garden stone. Shop for Personalized Gifts For Grandma, something for Mom or for another special person and occasion! Show off your love for your favorite kids, grandkids, nieces and nephews when you rock this adorable personalized t-shirt. There's nothing parents love more than showing off their kids, and this is just the shirt to do it in. These Personalized Grandma Shirts make great gifts for parents, grandparents, aunts and uncles. It is available on our premium, preshrunk 100% cotton t-shirts, machine washable in adult sizes S-3XL. Free personalization of any title and up to 30 names are included. Give her a gift that she will love to display in her home or office with our Personalized We Love You Keepsake Block. 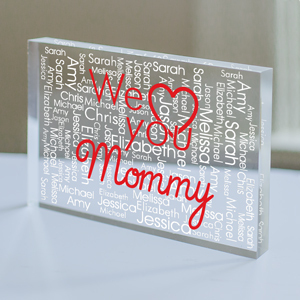 These acrylic block personalized mom gifts will be created with your choice of title color, choice of title and your own word-art creation with our exclusive word-art tool. If you would like to see another rendition of your word-art creation, simply click the View Your Personalization button again. Personalized Keepsakes for Valentine's Day make great Mother's Day gifts or Valentines Day Gifts!